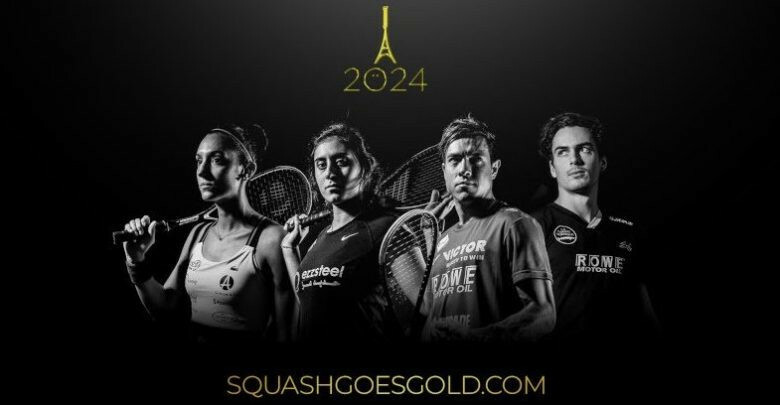 The World Squash Federation (WSF) and the Professional Squash Association (PSA) have come together to officially launch their campaign to get squash into the 2024 Olympic Games in Paris. The sport has been attempting to gain Olympic inclusion for some time, having been rejected for London 2012, Rio 2016 and Tokyo 2020. Other sports to have already launched campaigns for inclusion include snooker, chess and the electric motorcycling format Trial-E.
"Squash is played in some of the most spectacular locations in the world – in front of the Pyramids of Giza, on the harbourside-front in Hong Kong, inside Grand Central Terminal in New York – and our ability to showcase the beauty, youth and innovative drive of Paris by setting up an all-glass court anywhere in the city is something few sports can do," WSF President Jacques Fontaine said. "Squash Goes Gold will allow the squash community to further unite behind our Olympic campaign and play their active part in helping our sport secure its place at the Olympic Games." PSA chief executive Alex Gough claimed an Olympic gold medal "would be the pinnacle" for any squash player. He added: "As a sport we have made huge strides forward in the past decade; uniting the men’s and women’s professional tours, enabling us to reach parity in men’s and women’s prize money at major events, dramatically improving the sport’s broadcast arm and continuously improving both the spectator and viewer experience. "Squash is in the best position it has ever been and this campaign will allow the sport’s global player and fan base to get involved with the Paris 2024 bid directly and have their own influence on the future of the sport." Supporters of the campaign are able to donate to the cause via its website squashgoesgold.com. A "Gold" donation of £20,240 ($25,960/€23,020) would grant you lifetime STV access, VIP invites to major squash events and court time with players, among other rewards. The campaign has already received widespread backing from players, including France’s top ranked female player Camille Serme. "The chance to compete in an Olympic Games would be a dream come true – the chance to compete in an Olympic Games in my home city would be unbelievable," she said. Others to have publicly announced their support for the bid include Germany’s Simon Rösner, the 2017 World Games gold medallist, as well as the current men’s world number one, Egypt's Mohamed ElSorbagy, who posted on Twitter that he was "delighted" to see the campaign launched. Paris 2024 are due to submit their recommendations for new sports before the International Olympic Committee Executive Board meets in Lausanne from March 26 to 28. The IOC Session in June will then offer provisional approval before the new additions are officially confirmed by the Executive Board in December 2020. All five new sports set to feature at Tokyo 2020, baseball/softball, karate, skateboarding, sport climbing and surfing are also bidding to remain on the programme in Paris. February 2019: Liam Morgan: Battle for inclusion at Paris 2024 underway but which sports deserve to make the cut?